This is what the Cooper Station Post Office looks like to the 21st Century stroller. 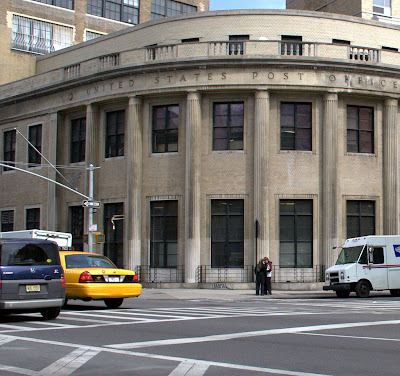 I cropped the photograph to cut down the influence of the tall buildings around the post office and I'm imagining this is more what it looked like when it was built in the 1930s. Does it surprise you that you can find reviews and stories of experiences at this post office on Yelp? Here's a nice uncomplicated posting. No research, no opinions, no videos, no links. 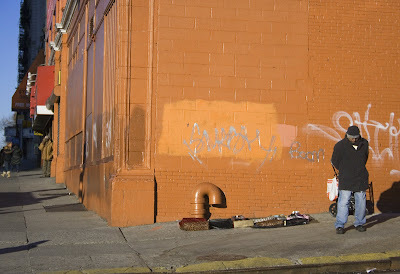 I took this photograph to record my location (10th Street) and then became captivated by the oranges, reds and horrible neon yellow (oops, an opinion) accented by blue, the complement of orange. 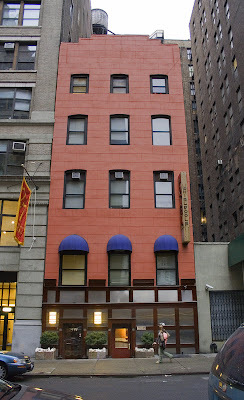 Does something seem to be terribly wrong at 65 Fourth Avenue? In case you can't see what that godawful mess of a façade is made of, here's a closeup. 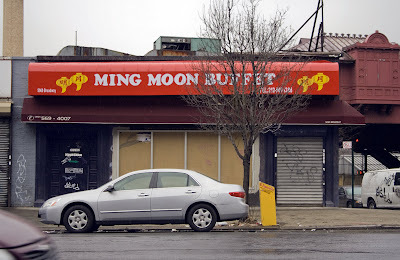 I must say, the reviews and excitement about this noodle shop have got me ready to go right back down there. Back to the visual mess. 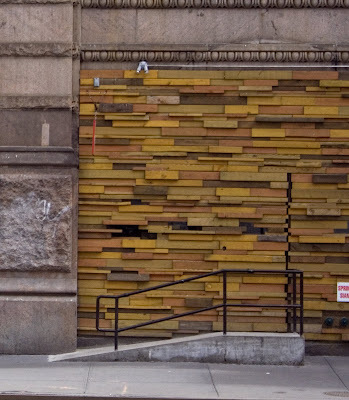 Since it's a chain, I guess they wanted to make it look like the shops in Japan, so they slapped these wooden slats onto a totally inappropriate building and walked away. 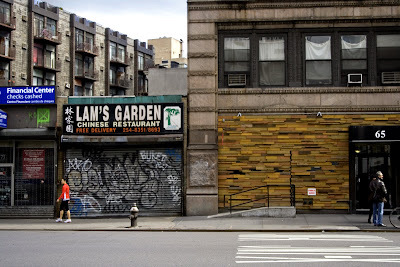 Actually, I was more interested in Lam's Garden when I took this and several other photographs, although it is probably not the John Coltrane of Chinese takeout, and is certainly not beautiful. 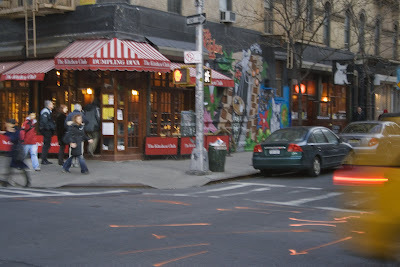 What it does have is a certain East Village visual integrity. BUT if this ramen is as good as they say it is, I'm prepared to breeze right past those wooden slats without a word of complaint. Fourth Avenue is the shortest of our numbered avenues, a mere six blocks long, and it also slants away from Third Avenue instead of behaving like all the other avenues and lining up in a very measured parallel way. Why did they make it an avenue, anyway? 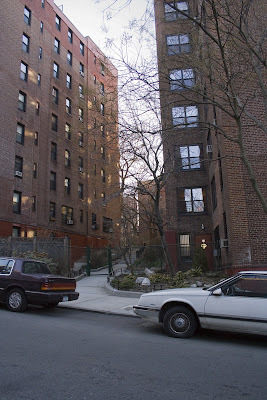 Originally, at 14th street, it straightened up and became a proper avenue, but then they renamed the northern part Park Avenue and Park Avenue South. 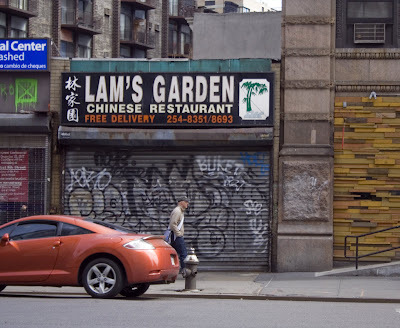 If you care about such things, please see Forgotten New York for a thorough history of this avenue. 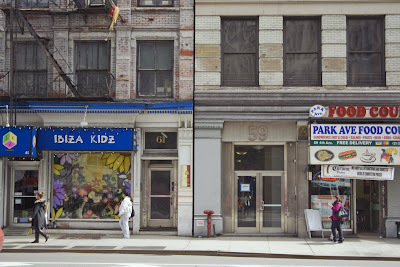 Above is an eye-level shot of the street across the street and below is a long shot of the same buildings. 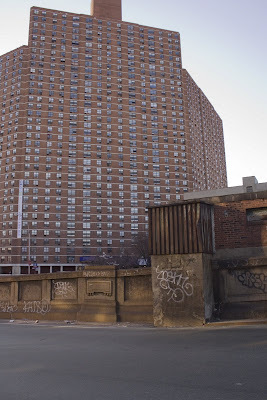 Don't you wonder what those apartments looked like when they were built? Imagine living on the top floor of the tall one. There are times late at night, perhaps after one or two glasses of wine, when I realize that I've put off posting because I can't decide which way to go with it. This short block will get one post only because it hardly deserves even one, photographically speaking, so anything I want to say, must be said tonight. Should I talk about why it's called Wanamaker Place and the Wanamaker Department store which replaced the A.T. Stewart Shop and in turn was replaced by the Stewart House, or should I talk about where are we anyhow, since Greenwich Village ends at Broadway and the East Village starts at Fourth Avenue, or should I talk about this soul-killing white brick apartment house (the Stewart House), especially since I'm reading The Death and Life of Great American Cities by Jane Jacobs, which is really smart and a delight to read. I'm going to talk about where are we anyhow. 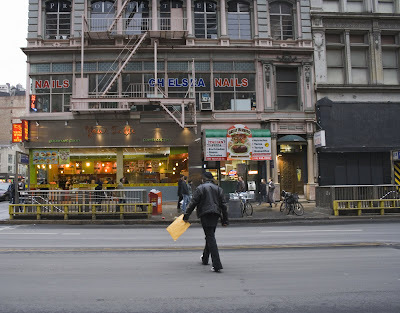 Noho ends at Astor Place/8th Street. 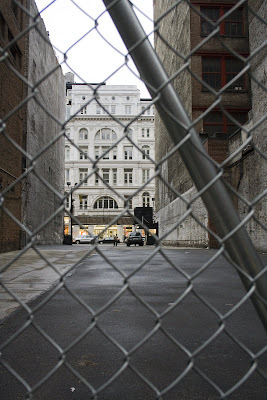 Between 8th and 14th Streets, there are 4 forlorn blocks belonging to no one. Only four because 11th Street avoids the whole issue by jumping that block. You do have your maps handy, don't you? 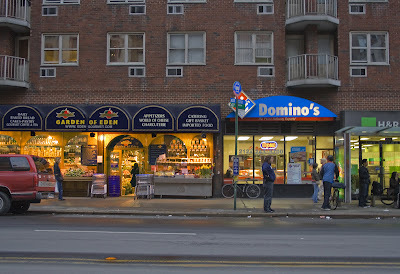 Wikipedia has avoided the issue by ignoring it, i.e., they say that Greenwich Village is bounded by the East Village and yet ends at Broadway, and vice versa, if you follow. I finally found a source that looked very official, but isn't, that called the boundary between the villages Fourth Avenue. I'm going with that and therefore, we are in Greenwich Village. Although it doesn't look like it. But even less like the East Village. Finally I managed more than one photo. I actually had a proper walk. It was nice today. Not spring yet, but promising. I went down to Beth Israel at Union Square to pick up some test equipment from my doctor. Since I didn't have an appointment, I couldn't be late, so I rode the subway an extra stop and walked back up Broadway, across Wanamaker, then up Fourth Avenue to Union Square. I've mapped all these blocks before (pre-photography) except for Wanamaker, a very dull one block street. 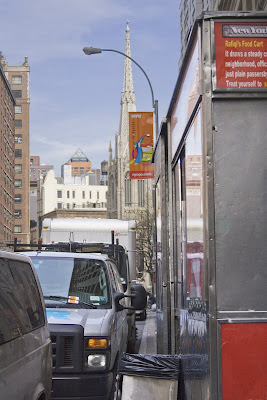 The spire in the background belongs to Grace Church which faces Broadway. I'll be turning before I get to it, but we'll see some buildings belonging to it on the back side. Looking at this photograph when I got home, I had trouble figuring out what I was looking at. It's this: the metal structure on the right is the back of a Rifiqi food cart and the cars are parked by the curb behind it. Another day of good intentions unfulfilled. You know how time can take you by surprise? As in, WHAT? How could it be 5:30 already? I was going downtown tonight to meet some artists to celebrate Elizabeth's birthday. The same Elizabeth of a few nights ago. We were meeting at The Kitchen Club at the corner of Prince and Mott at 7:00, and I planned to leave home at 5:30 so I would have time for a photowalk as I walked from the subway to the restaurant. Perfect. Except time took me by surprise. Not only didn't I leave at 5:30, I didn't leave at 6:00. I left at 6:10. Which meant that when I got off the subway at West 4th, I was late, so I took a cab, arrived a little late, but took the time to get one shot. Probably should have taken a few seconds more so it would be in focus. But it's all I got. 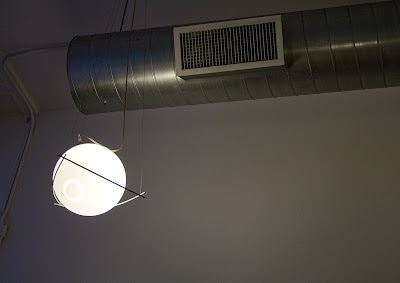 The Kitchen Club was fun and the dumplings were as good as the awning leads you to believe. (It says Dumpling Diva on the front, in case you can't read it.) But I think I made a mistake in the interest of economy in ordering the prix fixe. The salmon was fine but too ordinary. I probably should have gotten a big plate of dumplings. Yeah. I somehow got it in my head that it was going to be around 50° today. Probably NY1 with their dependably unreliable forecasts. So I'm sitting inside in my overheated apartment, thinking about the nice long walk I'm going to take. I'm getting all excited about nice long walks. But I did have sense enough to check the weather on my computer before I left. NOT 50°. 43°, feels like 33°. That's when I started getting cranky. And canceled my nice long walk. Decided to stick close to home. Went out and almost got knocked down by the wind. I took ONE photograph and came back home. This is a view (just a small slice) of the Park Terrace Garden apartments. 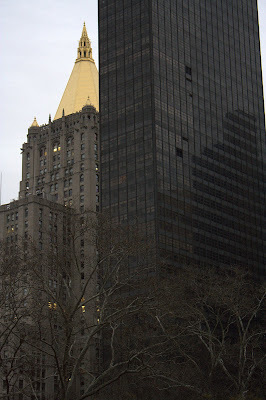 Goodby for now to the Flatiron District, but let's look back for one final image of the Met Life Tower. So pretty and pale. To refresh your memories, this trip was made in order to see The Pool Art Fair. Why it's called Pool, I do not know. 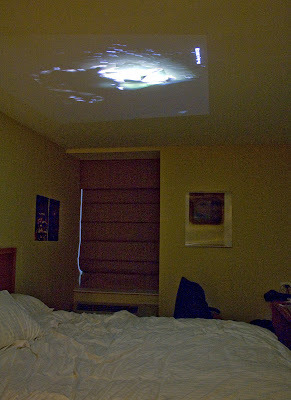 The idea is that each artist or group of artists has/had a room in the hotel to do with as they wished. Most artists hung their work as if it were a gallery space, but I was more interested in seeing the ones who used the space and transformed it (see below). It starts me thinking about what I would do. You? But first, and most important, this installation at the entrance was what I really came to see. How about it? 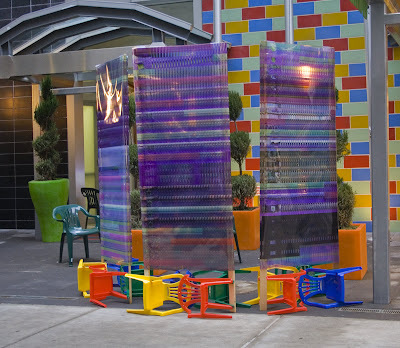 This was created by Elizabeth Riley, a friend of mine, who does installations, videos, and many other things. Check out her website! You'll be surprised to see what her sculpture is made of. I apologize to the artists for not having their names. If anyone has this information, pass it along, and I'll post it. My destination. The Wyndham Garden Hotel. All will be revealed tomorrow as I cannot stay up another minute tonight. I shot this building because it was so cute. And then I noticed it was a hotel (little teeny sign by the door says "Hotel"). Once you start noticing, it's surprising how many small hotels there are on side streets, and I'm always thinking about them for my brother and his wife who can't stay with me because Janie is allergic to cats. So I go home and google it. Yikes! A straight-on shot of the "birthday cake with vanilla icing" through the chain link fence on 24th Street. I left the photo oversized (when enlarged) in case you wanted to see details of the facade. 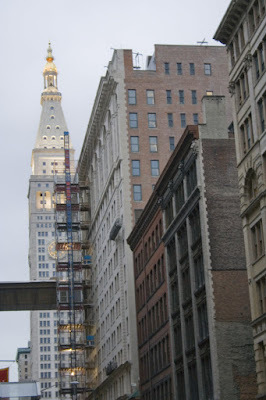 All over this area, you can see the golden spire of the New York Life Insurance Building shining above or between other buildings. Always an arresting sight. 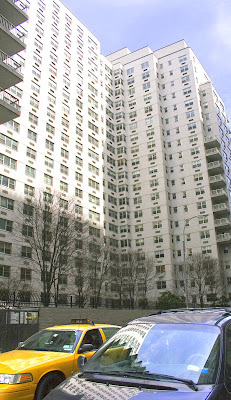 The building covers the block at the north end of Madison Park, from 26th to 27th streets, Fifth to Madison, and was built by Cass Gilbert in 1928 on the site of the second Madison Square Garden. It is clear that I haven't the means to depict it in all of its massiveness, so please go to Tom Fletcher's wonderful New York Architecture website for pictures and further information. Alert readers will have noticed we're in a new neighborhood, newly named anyway. I think we've been here before, but I was not alert and therefore I have a new relabeling task on my list. This is the Flatiron District and that is the beloved Flatiron Building, the triangular building made to fit the space created by Broadway crossing Fifth Avenue on a diagonal. Blessed Broadway! Of course, this shot does not demonstrate its triangularity, so please go here to see many good shots, including nice historical photos and even what was on the site before it was built. I always want to see that. 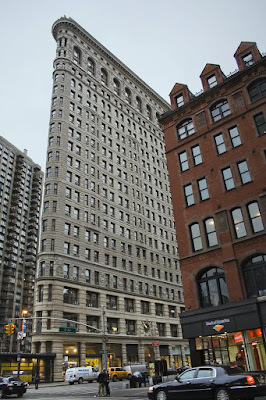 I was surprised to learn that this wasn't called the Flatiron District until about 1985 when restaurants started opening in the area and it became a more happening place. Naturally realtors wanted a nice name for this new neighborhood. 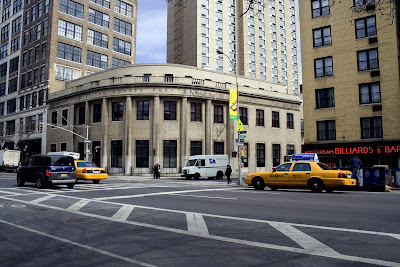 The boundaries are 14th Street to 28th and 6th to Park Avenue. That impressive building across the street with the arches and columns and flags is home to Home Depot since 2004. 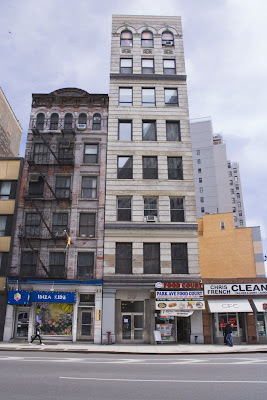 It is a cast iron building built in 1878 and the AIA Guide to New York City tells us that "it reeks of birthday cake with vanilla icing." Check the definition of the word reeks if you are wondering just what they meant by that. 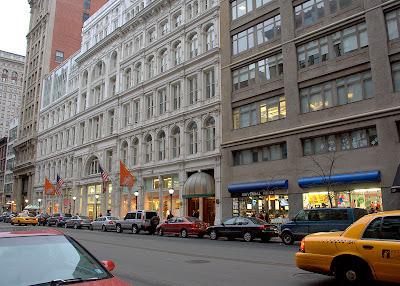 It was made for Stern's Dry Goods Store, owned by "New York's first merchandising family". If the phrase "dry goods store" conjures up an image of a general store out on the dusty old frontier, you are wrong, wrong, wrong, as wrong as I was. It means linens, fabrics and clothing. This was, after all the heart of the Ladies Mile of the 19th Century. 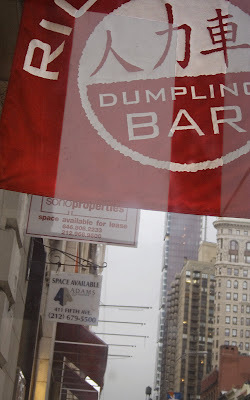 When I saw the Rickshaw Dumpling sign (see last night), I stopped short. This place was on my mental list to try . . . and hadn't I decided to do more eating on my walks? But I was supposed to meet Luka for dinner after this. What to do? You know the answer. I'll just have a taste I says to myself. In I go. Stopping only to take this shot from inside the entryway. I ordered the first thing I saw, Classic Pork and Chinese chive Dumplings with soy-sesame dipping sauce, because it seems the right thing to do when you're trying a new place, is to order a standard item by which to judge them. It was only later, studying the menu, that I had regrets. Peking Duck dumplings with hoisin dipping sauce? As well as . . . well you take a look. Minimal to a fault! Let's call it clean. The dumplings were good. Tender dough, tasty filling. Although, oddly enough, they weren't salty enough. You can get them steamed or fried, but not both, so I opted for steamed. Why, why, why? Okay, mindful of my dinner date, I stopped at three and took the other three with me. While sitting there, I took a shot of the ceiling. 1. 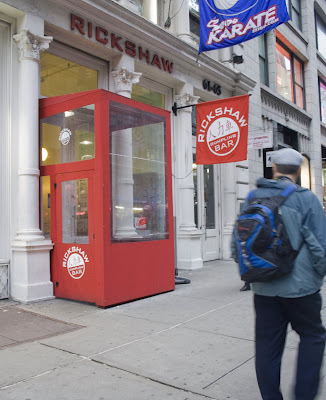 Visit the Rickshaw website; it's worth it. There you will learn that there is a Rickshaw Dumpling Truck and you can check its location on Twitter. 2. 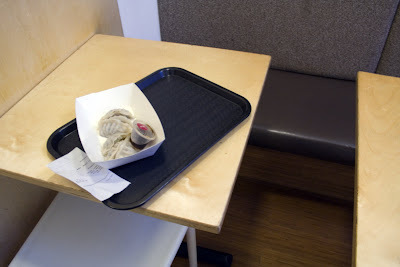 I carried the dumplings, looking for a deserving, i.e., hungry person, of course, having in mind, a homeless person. There were none to be seen. But I did spy a doorman lounging at his post and I thought, I can imagine being a doorman, tied to my post, and just thinking how I'd like something to eat, but I can't go get anything and being bored and hungry, so I asked if he was hungry and said I had some fresh dumplings and he did not hesitate one nanosecond, but accepted them with thanks. 3. Luka had to cancel dinner. This is as much as I can do tonight. It's 4:23 a.m. for god's sake. I'll fill it out tomorrow. All right, all right! I'll call it Chelsea. I'll have to change a bunch of posts from Midtown South to Chelsea. Soon. It doesn't seem right, but I keep seeing the block east of Seventh referred to as Chelsea and now there's Chelsea Nails across the street. 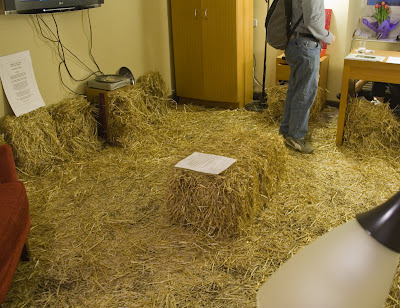 That's just the last straw. I give up. Uh, oh. Even Wikipedia says it now "runs as far east as Sixth Avenue." But why? From across the street, Your Taste seems promising; the red sign says Tapas Wine & Beer and it looks very colorful and inviting. A closer look, however, reveals a takeout counter and the promise of coffee, dessert, pasta, soup, sandwich, etc. Take a look at their menu – it has most everything except no tapas and no wine. Beer they have. Maybe the signmaker screwed up, and they got a discount on it. By the way, that is their sign; it says Your Taste at the top. 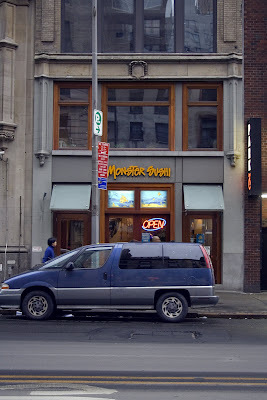 One building down from Garden of Eden is Monster Sushi. I used to go there now and again and found that if I set aside any idea of authentic petite sushi (yes, it is MONSTER), I could get some pretty tasty food. But then, it changed. It looked different and tasted different. Not in a good way. Now they've renovated. Maybe it's worth a try again. Restaurants can get better as well as worse. 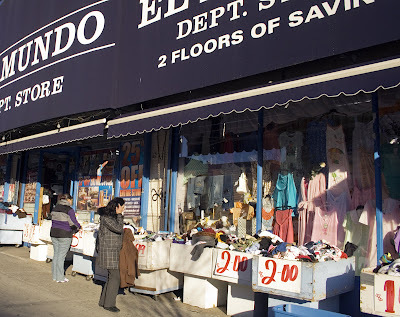 There, across the street, is the jewel-like Garden of Eden, with prices to match. But I stopped in later and gratefully paid top price for my precious Kesso yogurt since that's the only place I can get it now other than the home of Kesso yogurt on Sullivan Street, Yoghurt Place II. I took the No. 1 to 23rd Street, the plan being to walk across 23rd to 5th Avenue, then up to 24th Street and the Wyndham Garden Hotel. 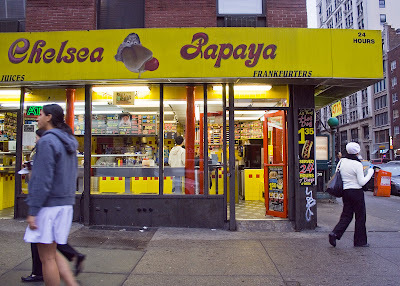 Across 7th Avenue was this hot dog joint, looking a little more ambitious than the usual. Go to Yelp to read 24 impassioned reviews and a little back and forth on Grey's vs. Chelsea. 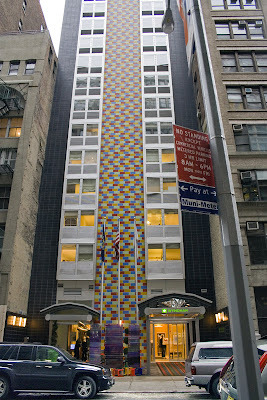 Late this afternoon I headed out to go downtown to see the Pool Art Fair at the Wyndham Garden Hotel on West 24th Street. But first, while still in Inwood, waiting (and waiting) for the traffic light at 215th Street, what's this? A new restaurant opening in this space. Not a club. A restaurant. It seems I'm not the first person to notice this. Can it succeed? The new windows in front are a good sign. This will be interesting to watch. Remember how I was complaining about how cold it was the day I took this walk (Feb. 24)? 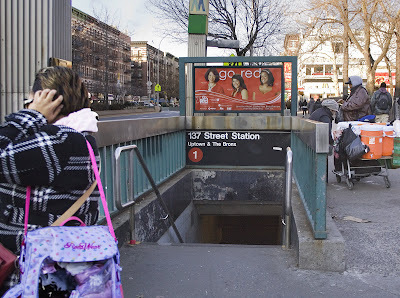 When I saw this subway entrance, I scurried down those steps just like any rabbit, gopher, chipmunk or meerkat. Warmth and home ahead. And now, March 7, not only am I at home and warm, but I'm so looking forward to daylight savings time! Don't forget to adjust those clocks. This is actually a somewhat backwards post. 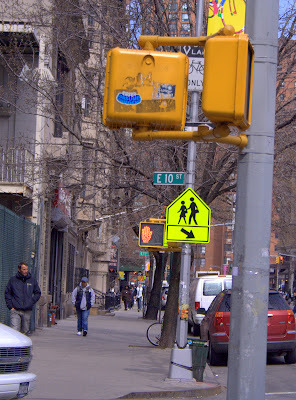 This is on the south-east corner of Broadway and 136th Street, whereas last night's post was on the north-east corner. This one should have come first. I know you need to know why this happened. First, this photograph needs another about half inch at the bottom. For all its charm, it is fatally flawed. So I was going to just skip over it. Now I have to ask you to overlook its flaw because 2) although I planned to start a new walk tonight, it did not happen. This wouldn't be the first time. Okay, moving right along, I had a realization on this walk that I should always start out hungry and I should eat along the way at every opportunity. 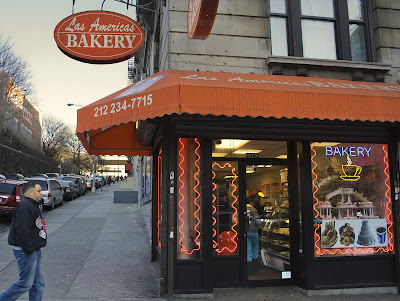 Don't you need to know more about this bakery than what it looks like? Yes, you do. And so do I. In the meantime, you can go to Eating in Translation to satisfy your need to know. Damn, I wish I'd had one of those. This little miss regarding me with suspicion is wearing a coat from Baby Phat which is a "sibling" of Phat Farm according to Wikipedia. To my surprise, Baby Phat is a line of clothing for women and girls. Not babies. Did you know that Phat is a backronym that means pretty, hot and/or tempting? Do you know what a backronym is? It's phrase made up to fit an already existing word to make it into an acronym. Now we're out of Manhattanville and into Hamilton Heights. See how it instantly became residental? Now we're coming up out of the valley. The subway goes back underground here and you can see the road slanting up. Unless it's an optical illusion. Okay, Manhattanville. It was incorporated as a village in 1805 at a time when New York City was way way downtown. 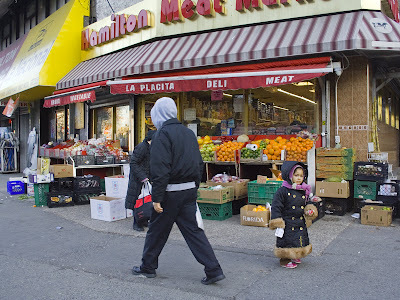 Uptown was rural with farms and scattered villages, but still New York. Somehow, it was okay to incorporate villages within the city. Why? I'd have to research city charters, I guess, to answer that. It had a good port and became a bustling, well populated village. 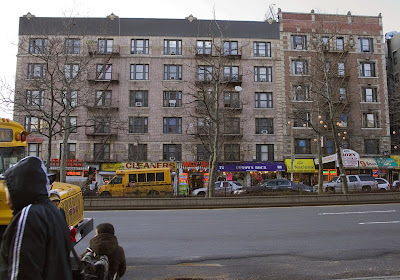 The other thriving village uptown was Harlem. And so it was until the coming of the subway in 1904, which led to Manhattanville's gradual absorption into the city. In 1912, The New York Times took note of the changes with this mournful headline: "Quaint Landmarks in Manhattanville Passing Away for Modern Improvements." And now? Be honest. How many of you even knew of Manhattanville's existence? 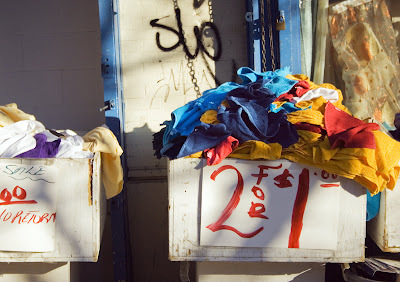 This sunlit display lies in front of another El Mundo Store. Up to now, there have been mainly warehouses and gas stations, but we're approaching some apartment houses up ahead.